Theory of Colour plays with the idea of the existence of a set of basic rules for combining colors in order to present, in a sarcastic fashion, the issue of the discursive or aesthetic assertions that define social distribution and exclusion on the basis of skin pigmentation. This exhibition emerges from an investigation into contemporary art produced over the past ten years in which artists from different generations and countries (South Africa, Germany, the United States, Mexico, Venezuela, Belgium, France, Peru, Argentina, Brazil and Spain) deal with the issue of racism. These practices reveal a diversity of approaches—nationalism, scientism, homogenization, exoticization, colonization, exploitation, sexualization—which display the complex web that underlies racism. Alexander Apóstol, Kader Attia, Zach Blas, Yutsil Cruz, Frente 3 de fevreiro, Rajkamal Kahlon, Anton Kannemeyer, Pedro Lash, Vincent Meessen, Erick Meyenberg, Daniela Ortiz, Juan Carlos Romero, Tracey Rose, Santiago Sierra and Roberto de la Torre. The Intruder, 2005, is a video work by Vincent Meessen. 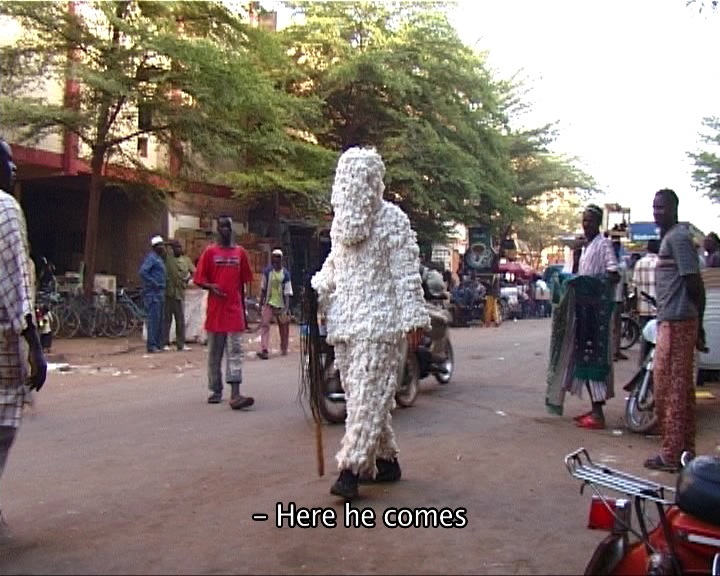 In the work, we see the artist dressed head to toe in an outfit made of white cotton blossoms, strolling along the streets of Ouagadougou, Burkina Faso. The camera, which does not long remain unnoticed, accompanies the performer while simultaneously recording the reactions of the observers. More information about the work in this article on the Argos website.